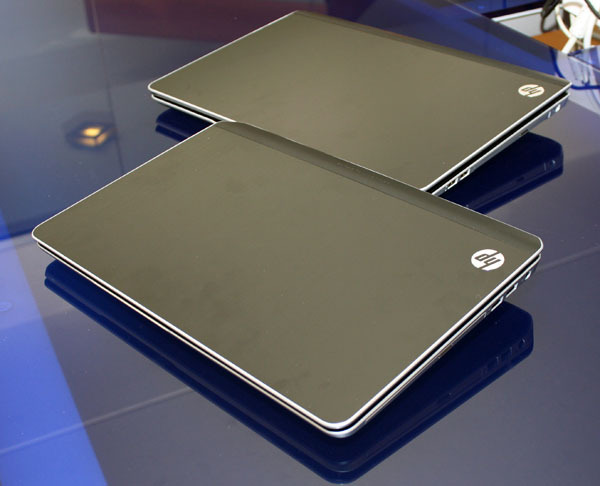 The 2012 versions of the HP Pavilion DV6 and DV7 notebooks were first showcased in Italy last week. The new Pavilion notebooks will sport an aluminum chassis and have curved edges with chrome accents. Earlier leaks have revealed that they may be equipped with the latest Ivy Bridge processors, but it has been confirmed that the both models will come with the current Sandy Bridge range of processors at launch. Regarding its specs, the DV6-7000 will have a 15.6-inch display with a resolution of 1366x768 pixels or with a little more money, is upgradeable to a full-HD screen. The DV7-7000 will have a full-HD 17.3-inch screen. The choices for CPUs include Core i5 and i7 chips. The DV6-7000 will be shipped with an NVIDIA GeForce GT 630M graphics card and a 1TB hard drive. The DV7-7000, on the other hand, will be equipped with a GeForce GT 650M graphics card and a 2TB hard drive. Both models will support up to 8GB of RAM. They will also come with the Beats sound system , USB 3.0 ports, DVD burners or Blu-ray optical drives and 1.2MP webcams. The notebooks are expected to be sold in the US starting next week for around $749 and $849 respectively.